Perhaps I should use these words by the Iranian writer, Parviz Owzia, in an exercise and ask my students what Parviz meant. Each time I look at them, I come up with a new meaning. “Seagull, seagull, how do you float? 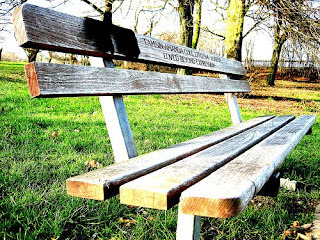 These benches are wooden memorials, as well as places of rest and refuge. Those marking a life are poignant reminders of how precious, and short, life is. One of my students, Pat Conway, came to a workshop last year and sent me the following: "Write Now! in New Mexico” was the best writing workshop I've ever been to. Every aspect was helpful: the exercises, the feedback, the sharing. It made me realize that WRITING is the point, not writing a book or even getting published. Those can all come or not; writing is the goal. Your teaching helped me remember that I don't want to die with my song unsung." So go for that walk, look at the sky, the kites, the grass. Then come home and write.